This is the fourth story in a series that The Hechinger Reportis publishing in partnership with The Atlantic about efforts to reform the high school experience at one of New Hampshire’s lowest-performing campuses. 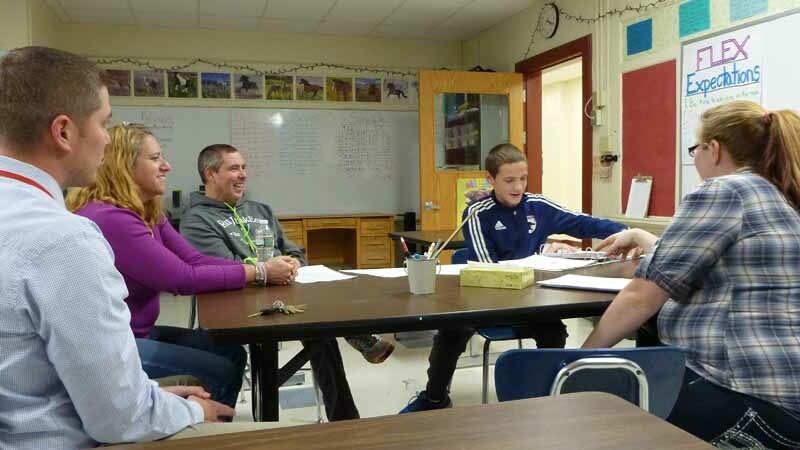 PITTSFIELD, N.H. — Pushing up the cuffs of his plaid shirt and adjusting his glasses, ninth-grader Colton Gaudette looks across the small classroom conference table at the day’s special guest. “Welcome to my student-led conference,” he says. “Thank you for inviting me,” answers his mother, Terry Gaudette. 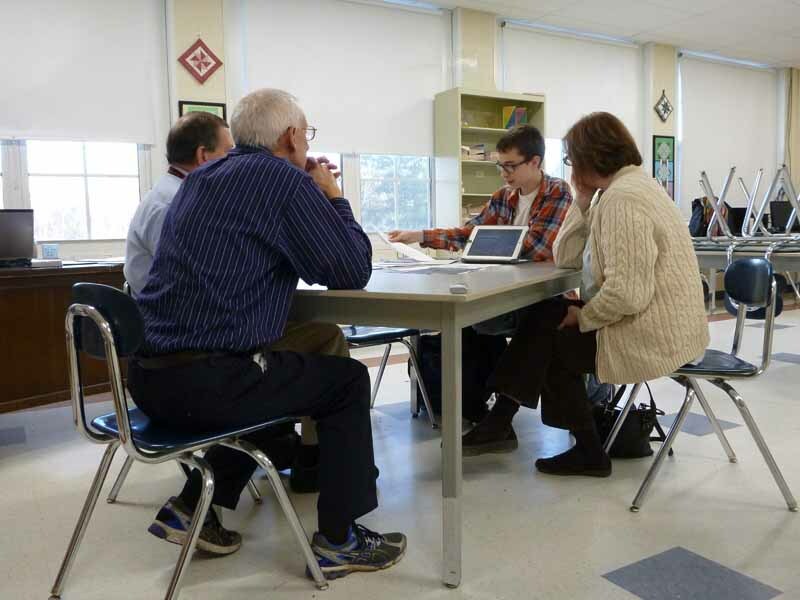 This family meeting has replaced the old format of parent-teacher conferences at Pittsfield Middle High School, a rural New Hampshire campus that takes a “student-centered learning” approach to the business of schooling. In 2008, Pittsfield was rated one of the state’s lowest-performing high schools based on students’ standardized test scores, and as a result it qualified for a federal School Improvement Grant. Pittsfield is also part of the New England Network for Personalization and Performance, a coalition of 13 schools sharing a $5 million federal Investing in Innovation, or “i3,” grant. And in 2012, Pittsfield was awarded an additional $2 million grant from the Quincy, Mass.-based Nellie Mae Education Foundation to support student-centered learning. With this model, students are given more freedom in choosing how, what and when they learn, and teachers are considered collaborators and coaches. Advocates contend this provides superior preparation for college and career by helping students connect their individual interests to their academic learning and future goals. Students are also expected to shoulder more responsibility for their school lives, and at Pittsfield that includes taking charge of the twice-yearly status meetings attended by their families and campus advisers. The student-led conferences may also be a way to teach skills you can’t learn from a textbook: organization, long-term planning, confidence with public speaking, collaboration and self-reflection — even how to shake hands and make introductions in a more formal setting. That aligns with a larger goal for Pittsfield’s students — to move beyond rote knowledge to develop the kind of critical-thinking skills needed for “real world” success, said John Freeman, the district’s superintendent. Indeed, from New York to Washington State, student-led conferences have been praised for reinvigorating an otherwise perfunctory process. That’s certainly been the case in Pittsfield, according to school officials and families. Prior to the adopting the new format a few years ago, turnout for the traditional parent-teacher conferences was dismal, with a participation rate of less than 20 percent. Now, more than 90 percent of parents regularly show up, according to the school’s data. At the classroom table, Colton lays out samples of his schoolwork —showing some of his strongest work and several assignments with which he had less success. In English class, Colton says he had an easier time crafting his literary analysis of “Lord of the Flies” than the subsequent assignment for “The House on Mango Street.” He’s working hard to keep his grade up in geometry, and intends to earn at least a 3.5 (out of possible 4) for both semesters. His geopolitical studies class is going well, as is computer-assisted drafting — his blueprints for a set of shelves turned out better than his first effort, at designing a stone bench. In addition to discussing his academic work, Colton shares the results of several questionnaires used by the school to help him learn more about his personality and learning style. The results: “I’m empathetic, artistic and kind of shy,” Colton says. His strengths include music, writing and hands-on learning. The personality assessments bolster the plans he has for the future: He wants to study creative writing in college and potentially launch his own comic book company. So Courtney encourages Colton to look for more opportunities to connect his artistic interests with his academic learning — he could have gone further with an in-class assignment asking him to describe the life cycle of a cell, for example. At the conclusion of the conference, Colton thanks the adults for participating, and says he is feeling good about where things stand for him. “That was very well done, very thorough,” Strickhart tells him. His mother is also impressed. At Pittsfield, students are expected to begin preparing for the conferences about a month ahead of time. They use a checklist to mark off each of the requirements — including confirming the meeting times with all of the adults, reviewing their portfolios and preparing answers to the self-reflection questions. Lauren Martin, a Pittsfield senior, said even though it means more work for her, she prefers the revised format to the traditional conference, which didn’t usually include the students. Instead, she would have to wait at home for a replay — and then only get her parents’ perspective on the discussion. Now, as each semester progresses, Lauren said she’s keeping an eye out for projects and papers she wants to add to her portfolio, which serves as the backbone of her conference presentation. The co-author of a book of case studiesexamining school approaches to “deeper learning,” Martinez said the student-led conferences can be a powerful tool for boosting engagement. That being said, a student-led conference by itself won’t mean much, Martinez added. Pittsfield English teacher Jenny Wellington agrees. The schoolwide shift to student-centered learning is one of the reasons the conferences work, according to Wellington. In class, students get a say in choosing their academic projects, which not only makes them more excited about working on their assignments but also about presenting them at the conferences once they’re completed, she said. She added that the conferences don’t preclude parents from getting in touch with teachers at other times to ask questions or to request meetings. Pittsfield’s teachers said the conferences are also an opportunity to observe students’ interactions with their families, and those moments can be an important window into understanding their attitudes and classroom behavior. Conferences don’t always go smoothly. Wellington said she’s observed meetings in which a student’s stated post-high school career plans vastly differed from what their families had in mind. For example, one student was hoping to attend an out-of-state college, while her parent expected her to stay local or perhaps prepare to work in the family business. In such instances, Wellington tries to encourage the families to use the conference as an opportunity to talk through their differences. Ideally, the result will be a plan of action that incorporates the student’s goals while fostering parental support. To be sure, those kinds of negotiations work best when teachers know their students well. And Pittsfield’s small size certainly helps in that regard. But Wellington, who taught middle school for six years in New York City, said she could also see it working in a larger school setting provided there is a reasonable student-teacher ratio. Pittsfield tries to accommodate parents’ requests to schedule the student-led conferences early in the morning before class or in the evenings after they finish work, Wellington said. That’s a better use of her time, she said, than the standard procedure at her old school in the Bronx, where classes would be canceled for a day and parents had to show up during that time — or not. While the successes and benefits of the student-led conferences are widely acknowledged, there is also agreement among Pittsfield’s faculty and administrators that there is room for improvement. Parents of older students have been through the process enough times that it’s becoming familiar and even rote, said Derek Hamilton, Pittsfield’s dean of operations. More families seem to be having regular conversations at home with their kids about their day-to-day academic progress — a very positive development, he added — but that means there isn’t as much new information to share in the twice-yearly conferences. To combat that fatigue factor, Pittsfield is looking for ways to make the conferences more explicitly about the student’s post-graduation plans and goals and to “raise the stakes” for their presentations as they advance by grade, Hamilton said. That could mean asking juniors and seniors to present in front of a larger audience, including community members from outside the school, rather than just sitting at a table with parents and teachers, he suggested. In the meantime, it’s clear that the basic logistics of the existing conferences are teaching the students important lessons, contends Hamilton. Paulette and Matt Wolfe, the parents of two Pittsfield students, weren’t likely to skip the school conferences before the switch to the new format. 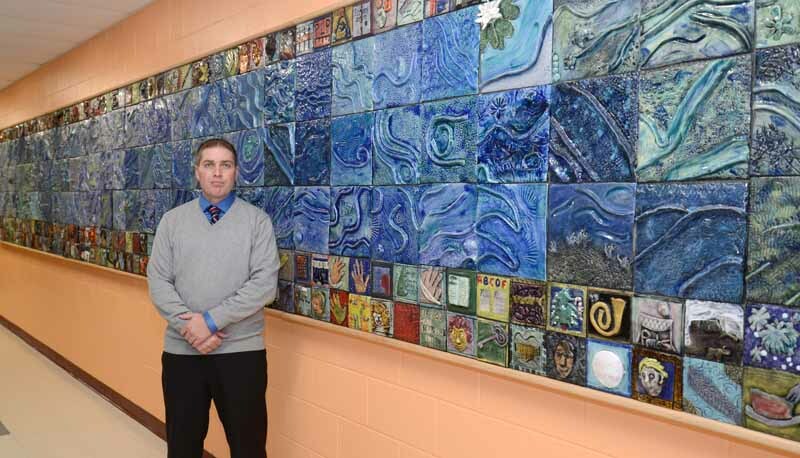 But they both said they prefer the student-led version and the overall direction the school has taken to teaching and learning in recent years. Freshman Colby Wolfe has taken advanced math classes since the seventh grade, and said he hopes to follow his mother — an investment banker — into a career in finance. During his most recent student-led conference, his adviser, Jessica Bickford, told the family that the reports she’s gathered from his other teachers are highly positive. Because Pittsfield allows students to take advanced classes once they’ve mastered their required grade-level content, Colby will have accumulated enough credits by the end of freshman year to be ranked as a mid-year sophomore. Part of the reason Colby’s doing so well academically, he said, is that he gets to choose projects that most interest him and relate to his post-high school goals. One example: In a “learning studio” project —in which students teamed up to do a deeper investigation of a particular issue — he looked at the financial aspects of professional sports, an assignment that required him to incorporate academic work from several different classes. His sister, Alison — a member of Pittsfield’s class of ’16 — was able to graduate early with a year’s worth of college credits, thanks to the school’s dual-credit program. Colby said he’s glad to know he could have a similar option a few years down the road. But for now he expects to want to stay for the full four years so he can also play soccer, continue to take advanced math classes and be involved in student government — all goals that showed up in the blueprint he presented to his parents and Bickford. While it was largely an upbeat conversation punctuated by moments of genuine humor — Matt Wolfe joked to his son that “this is the most I’ve ever heard you talk at one time” — Colby didn’t gloss over the facts. He said he’s finding some aspects of his English class challenging (his grade is the equivalent of a solid B while he’s getting an A grade in math), including a recent assignment that required him to connect a fiction reading to real-life experiences. He was also disappointed not to have stronger marks in Spanish. His overall grade should be higher based on his perception of how well he’s mastering the language, he said. “That might sound like I’m just complaining, but I’m not,” Colby said, his wry tone drawing some light laughter from the assembled adults. When Bickford mentioned that Colby could speak to the Spanish teacher about his concerns, the high school freshman respectfully rejected the suggestion — at least for now.